Rafael Hernandez is the director of Angeles del Desierto – the Desert Angels, a non-profit humanitarian group that performs search and rescue missions for immigrants who become lost while trying to cross the border into the U.S.
Often times, Hernandez says, his group’s efforts are more about finding closure for the families of immigrants than about finding the immigrants themselves; many don’t survive the dangerous journey across the rugged borderlands areas they cross through. Sometimes the Desert Angels are searching for these immigrants’ remains. Hernandez has been in West Texas looking for any sign of a man named Jesus Javier Adame Riojas, a man from Chihuahua, Mexico who Hernandez says tried to cross into the Presidio County area of Texas sometime around June 2015. According to Hernandez, the man was traveling with 5-6 other people when he became sick and was left behind near the Chinati Hot Springs. 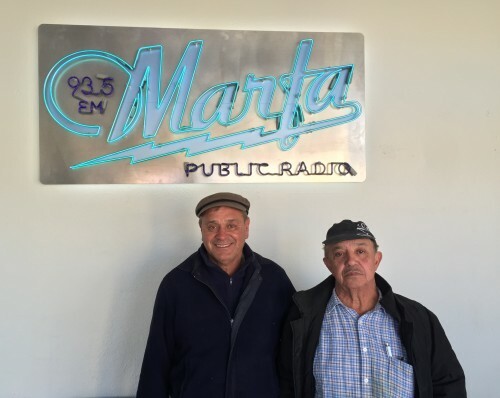 It should be noted that Marfa Public Radio hasn’t independently verified the authenticity of this story, though Hernandez says he has been in touch with the man’s family in Texas and Mexico, and one of Hernandez’ fellow volunteers showed us the business card of a Presidio-area Border Patrol agent that he says helped them identify what authorities believe was Adame Riojas’ last known location. Hernandez says his group often receives informational support from the Border Patrol and local law enforcement, though they don’t follow him into the field on his search missions. He describes his group as a supporter of law enforcement’s efforts to find missing people, picking up the cases where they appear to have gone cold. He also describes the Desert Angels as an explicitly non-political group. In our interview, he refused to weigh in on the high-profile political debates happening around border security, nationwide and of course here in Texas. “We only try to save lives,” he says. Still, given what he’s seen in his 18 or so years of doing this humanitarian work, Hernandez does have a message for people thinking about crossing illegally into the U.S.: it’s not worth the risk. Correction: An earlier version of this post said Hernandez believed Adame Riojas had gone missing in June 2014. That sentence should have read June 2015. NECESITO INFORMACION SOBRE COMO PUEDO HACER PARA CONVERTIRME EN VOLUNTARIO Y COOPERAR LOS FINES DE SEMANA CON USTEDES, AYUDANDO A PREVENIR MUERTES DE INMIGRANTES.